as nearly all of them reference treasure, the sea, or ships in some way. As of April 2011, there have been 14 opening themes, 18 regular ending themes, and a number of film- and special endings as well. 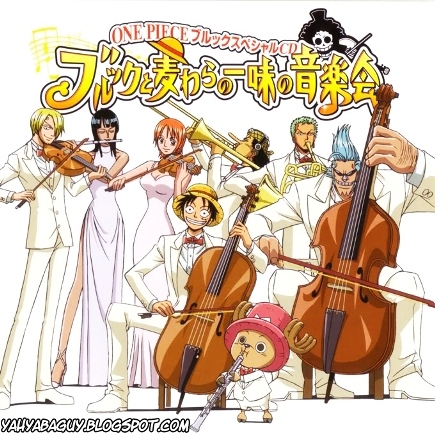 Soundtrack CDs released in Japan also include a large number of "image songs" based on the series, performed either by cast members in character, or by theme song artists. 4Kids' dub of the series has stripped the opening and ending music of all episodes in favor of a "more catchy, kid-friendly" version. This "One Piece Rap" (as it is infamously known) keeps the music basically the same throughout each of the episodes (with one or two edits here and there with each new member of the crew). During the show, there has also been recognizable music play in the background (like Dvorak's New World Symphony and Beethoven's Ode to Joy). ada yg bink sake na brook tidak gan? mantavv gan.. dah ada sOng tuk Op 517..
jadi pengen dengar. kayak gmana..
Mirror ke mediafire sudah ditambahkan.. Opening 5 yg tv size ada gan? ooh iya, bink no sake nya ada kah? ?